I recently pinned down the family of Hannah Andrews, my ggg-grandmother. I thought I would give an account here of how that happened. I have documented Hannah previously in On Poverty, Records, and Chicken Thieves, The Brick Wall Stories: A Theory on Hannah Andrews and The Brick Wall Stories: Hannah Andrews. I have listed a lot of sources there, so I won’t do that today – just my thought process as I went through this for the last 4 years. Future work on these lines will bring up more documentation. Hannah’s youngest child was my gg-grandmother Emma Luella Lamphere. I had to trace Emma’s scattered history back a ways to even find Hannah. Emma had been born in Tuscaloosa, Alabama (and that was as far back as our vague family recollections went), but thanks to census records I began to realize her parents were from southern New England, and I found them and their Connecticut-born older children in some basic Connecticut sources. I knew Hannah’s name from her marriage to Russell Lamphere recorded at Norwich, Connecticut in 1838. “Hannah Andrews, of Ashford, Connecticut“. Hannah married Russell Lamphere and had four children in the industrial areas of Norwich Falls and Greenville, Connecticut: William H. (b. 1840), Sarah E. (b. 1843), Charles C. (b. 1844), and Caroline M (b. 1847). In the 1850 census Russell is listed as a “Machinist” with property worth $700; really not a bad level of prosperity considering he was one of 14 children and would likely have received nothing from his father at that point. 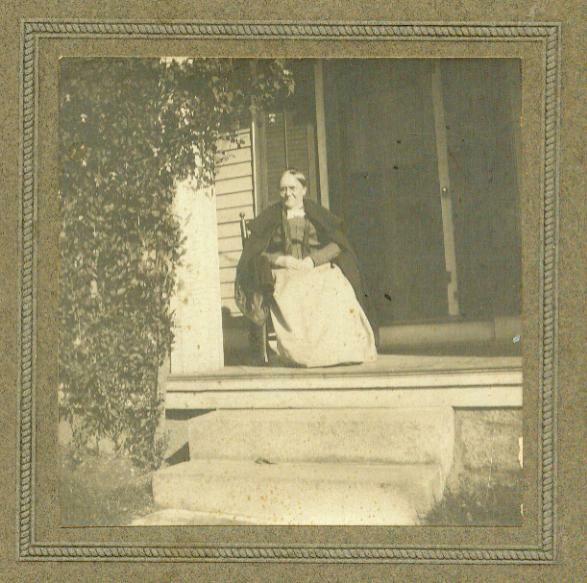 During the early years of her marriage, Hannah often lived near or with an “Alden Andrews“, a farmer a year or two older than her, who married twice and became the father of a number of children. 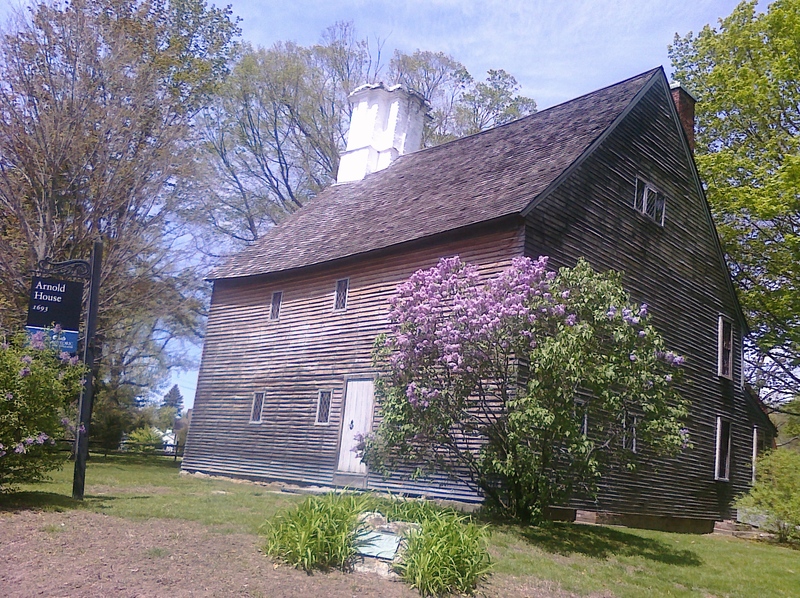 Later in the 1880’s (after Hannah’s death), one of Alden’s sons lived in Russell’s household and was working in the mill with Russell. This, as well as the fact that Alden named his first son Russell, is how I knew early on that Alden and Hannah were siblings. Russell Lamphere was an ambitious man who took his family from the booming mill town of Norwich, Connecticut and headed south to Tuscaloosa, Alabama to start a business around 1852. The south was anxious to process more of their own cotton and not depend on northern industries so much; I can only assume that this may have been part of his motivation. I wonder how they made the trip? 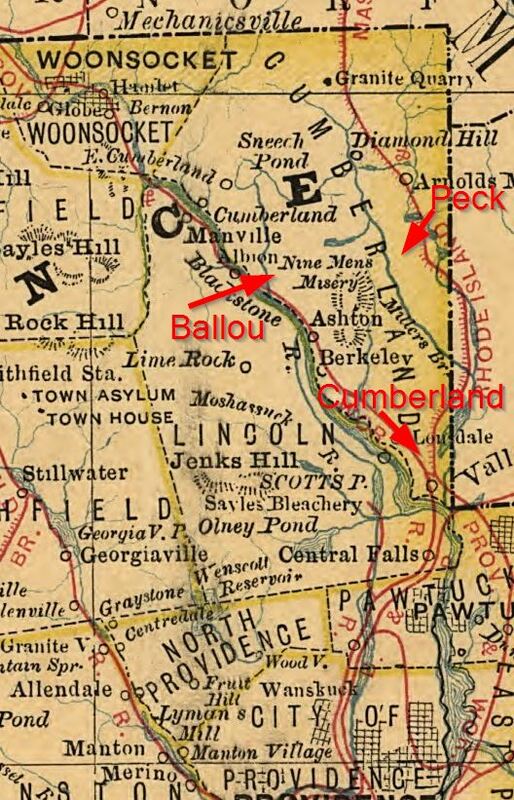 The Lampheres were not used to traveling – Russell’s brother William reported in his 80’s that he had never left their county in Connecticut – I wonder if the trip was by water, with an inland journey by carriage? A younger sister or cousin of Russell, and her new husband, also found their way to Tuscaloosa, but otherwise, they went alone. Hannah and Russell’s last child, Emma was born in 1854 in Alabama, and, lacking birth records, there could have been other children who did not survive. I learned from Tuscaloosa newspapers (In Which I Stoop to Buying Microfilm) that Russell’s business partner died around 1860, and Russell opened a metalworking shop in downtown Tuscaloosa. I am still uncertain what the original business was. The business Russell advertised in 1861 after the death of his partner. Other than a family memory that things didn’t go well with the business because of the Civil War, and that it was unsafe after the war, no one really knows how it all went for them. Hannah raised her young children and, presumably, watched them become quite southern, during divisive times. The Tuscaloosa newspapers of the 1860’s were full of bitter, hateful reporting leading up to the Civil War. How was that atmosphere for Russell and Hannah? Were they conflicted? The sons were grown by the time the war broke out. Charles definitely served in the Civil War as a Confederate soldier and stayed in the South for the rest of his life, and I believe William died in 1912 in Tuscaloosa. In both cases I am basing this on how they named their children and some claims about being born in Connecticut. There had been some letters from a civil war soldier among my family’s possessions, now lost – I suspect these were from Charles or William to their parents. I’m sure the well being of her family and the safety of her sons placed Hannah squarely on the southern side of this conflict. Towards the end of her life Hannah suffered from a “long and painful illness.” She may have been ill when the 1870 census taker came around to a room in a boarding house shared by Emma and her father in Meridian, Mississippi (A Story Just Like Russell Lamphere’s). I have not found any other family member in the 1870 census. Where were Hannah and her daughters Sarah and Caroline? Could their absence have something to do with Hannah’s illness? Hannah’s daughter Emma Lamphere Darling , 1857-1927. Emma, her daughter and granddaughter were tall and thin, with long, narrow faces and a sort of stateliness. My guess would be, Hannah looked something like that. Between 1870 and 1875, Russell and Hannah moved the family up to Johnston, Rhode Island, just outside of Providence, where Russell was a “Manufacturer of Cotton Goods” according the the Rhode Island state census. The west side of Providence, and Johnston, were filled with many textile manufacturing operations, large and small, at that time. Daughters Sarah and Emma were living with them. I have never determined what happened to Caroline, but she may have come north with the family since Russell’s obituary, much later, mentions a daughter in Eden Park, Cranston, who could not possibly be the other two daughters. After leaving the south, it’s likely Hannah never saw her two sons again, although I can’t be sure of that. 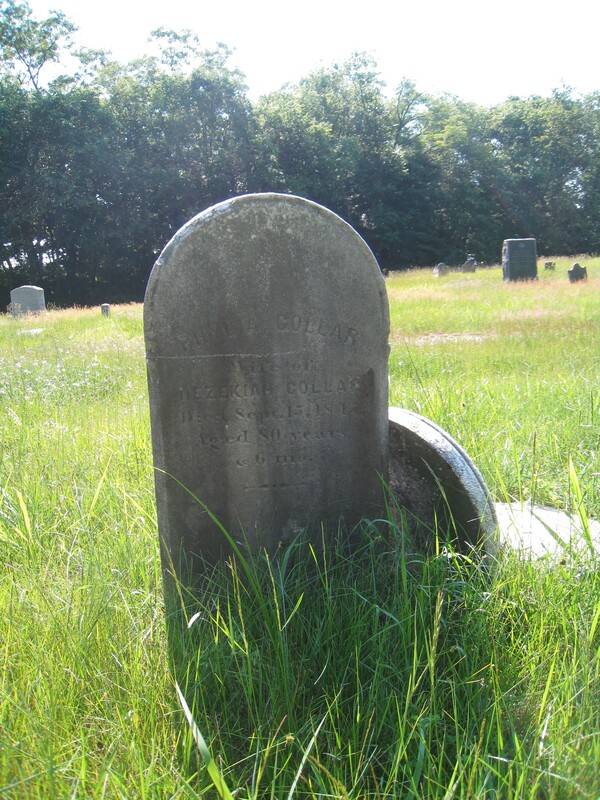 Hannah died in 1878 in Providence, of gall stones. She is buried in an unmarked grave at Yantic Cemetery, Norwich, likely a plot purchased by her husband in happier times. from The Providence Daily Journal, June 25, 1878. Within the next year or two, her daughters Emma and Sarah married, and her husband remarried. Was her illness another long, sad note in the difficult times this family faced? Or was it actually relatively brief? Did it impact how the business venture in Johnston went? The family had moved on to Providence by the time of her death, where by 1880 Russell was an overseer in a large mill, obviously not his own. It’s sad to think of them burying her far away (and Russell followed her, a couple of decades later), and probably thinking, for years, that they would put up a headstone, a plan that never came to fruition. 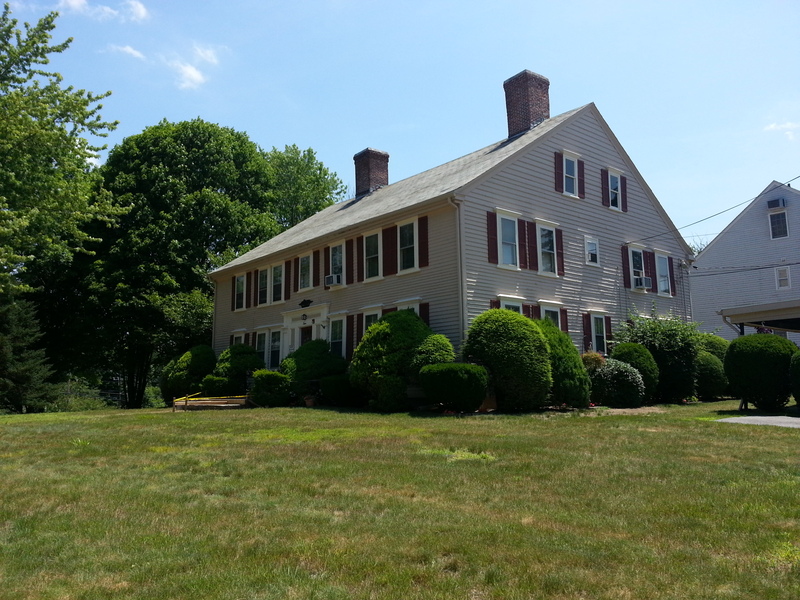 At first, I thought it would be easy to discover the Andrews of Ashford, Connecticut, and learn about Hannah’s origins. Ashford is a little town in rural northeastern Connecticut, well north of Norwich. I knew Hannah’s story was a little bit complicated, because sometimes she and Alden, or their children, reported them being born in Massachusetts, sometimes Connecticut. 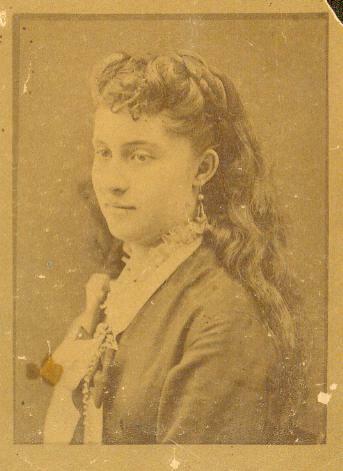 Her Providence death records reported her parents as Jesse and Sarah Andrews (Alden’s 1873 death record lists a father, Jesse, only), and her birth place as Coventry, Connecticut. Nothing much came of the Coventry clue, so I moved back to a more contemporary record. Knowing she was “of Ashford” in 1838, I checked the 1840 census records. No Jesse Andrews in the 1840 census. In 1830, Jesse Andrews was living in Ashford. His household showed only a man, 60-70, and a woman, 50-60. Next to him was a “Benjamin Andrews”, also in a household of 2, a younger man and woman. The 1820 census for Ashford showed Jesse Andrews in a bustling household of 11; a male over 45, a female 26 – 44, and 8 of the occupants were 16 or under. One person was engaged in Agriculture and 5 in Manufactures. The 1810 and prior census records showed no Jesse Andrews anywhere in Windham County. I readily admit, I was confused. How could that lonely household of 2 in 1830 have been the family of Hannah and her brother Alden, who would have been around 11 and 13 that year? 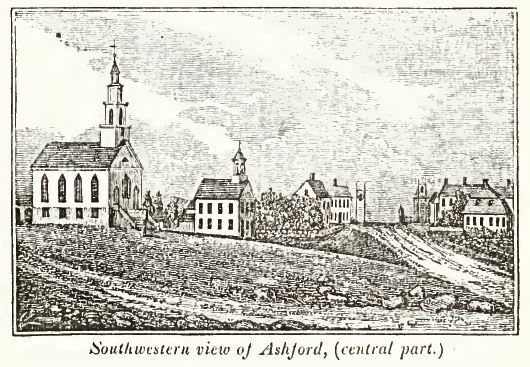 Ashford, from Connecticut Historical Collections by J.W. Barber, New Haven, 1836, p. 417. I set about hunting every Jesse Andrews I could, in New England. One was married to “Sarah” and they lived their lives in Montague, Massachusetts. The trouble was, in the years when Hannah and Alden could have been born, they were busy having several other children, and they raised a large family and never left Montague. They were never in Ashford. The only other Jesse Andrews that married a “Sarah” was a 1795 marriage record in Warwick, Rhode Island, for Jesse Andrews and “Sally Arnold.” Surely, that was too early for children born in 1817 and 1819. And, of all the Connecticut and Massachusetts references I had seen, no mention was ever made of Rhode Island. A visit to Ashford showed no vital or probate records for any of the people I knew, or any likely Andrews. On another trip I went to Eastford, an offshoot of Ashford, again, nothing. The one thing my Ashford visit turned up was a deed from Jesse Andrews to Alden Andrews in January, 1838 for the purchase of a 50 acre tract of land in southeastern Ashford. It was good and bad news. The names were unusual enough, and the year was the exact year that tied her family to Ashford, 1838, so I had to accept that this was Hannah’s family. That was great, I had found them. What was bad was the poor documentation and subsequent disappearance of Andrews from Ashford. In the only other deed for Jesse, he (“of Ashford”) purchased the same property, with a mortgage, in 1832. Alden lost the property by 1840, and was in Springfield, Massachusetts when he married for the first time. I suspect Jesse was dead by 1840. And here things sat for quite a while. I pursued a line of Andrews that came from Ipswich, Massachusetts to Preston, Connecticut for quite a long time, and some Andrews from the Hartford area. Alden’s name is unusual enough that I felt, for sure, I would find it. I didn’t. About a year and a half ago I began again my hunt for Jesse and Sarah, and this Benjamin Andrews who was a neighbor. It’s almost hard to say why this clue was so big, but as I searched census records I finally noticed that there was an 1850 census record in Eastford for Benjamin Andrews, who was a 41 year old recent widower with two children, and a woman named Sarah Andrews, 74 and both Benjamin and Sarah reported being born in Rhode Island. Suddenly, it all made sense. Benjamin was another son of Jesse Andrews, and Sarah was his mother, who was by then a widow. If they came from Rhode Island, she could be the “Sally Arnold” who married Jesse Andrews in 1795. Benjamin could have been born in Rhode Island around 1809. Jesse and Sarah could have been the older couple in Ashford in 1830. Sarah’s age when Hannah was born in 1819 could have been, say, 44. Not completely crazy. I visited the Connecticut State Library around this time, and learned that Sarah continued to live with Benjamin, during his second marriage, until she disappeared from the Norwich city directories about 1862. No death or probate records, and that was too bad because I was hoping to find a death record that gave Sarah’s maiden name. None turned up. Benjamin himself developed quite a criminal record towards the end of his life and spent time in prison. 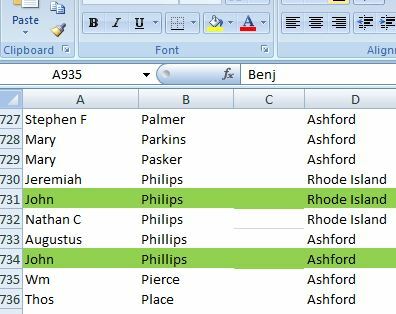 Jesse was the son of Phillip Andrews, according to his marriage record and a manuscript I found at the Rhode Island Historical Society. This rather obscure Andrews family descended from a North Kingstown, Rhode Island founder – one of the Fones purchasers – John Andrews (sometimes McAndrews). Jesse had a grandmother named Hannah. Jesse’s part of this family was not well documented, but he and one brother, Christopher, had detailed marriage records that have survived. Phillip, the father, had an active military career in the French and Indian Wars and the American Revolution. He was sometimes in the company of a Benjamin Andrews. The name of his wife is unknown. 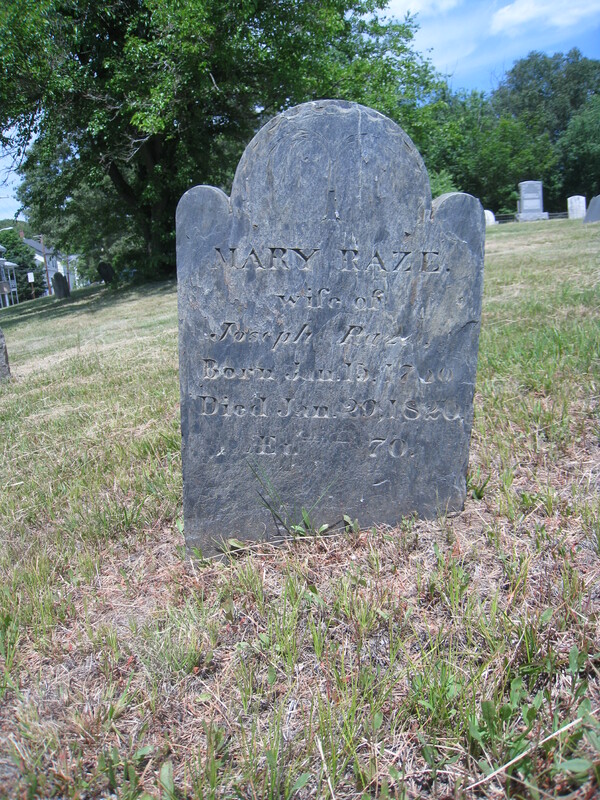 He died before 1795 when he was “dec’d” on Jesse’s marriage record. No probate. East Greenwich Town Hall, formerly the Kent County Courthouse. Photo by Diane Boumenot. Since I knew from the marriage record that Sally’s father was Joseph Arnold (an extremely common name in that place and time) I noted that Jesse often lived next to a Joseph Arnold, and also another neighbor named Freelove Andrews, possibly Jesse’s widowed mother, whose name is unknown. 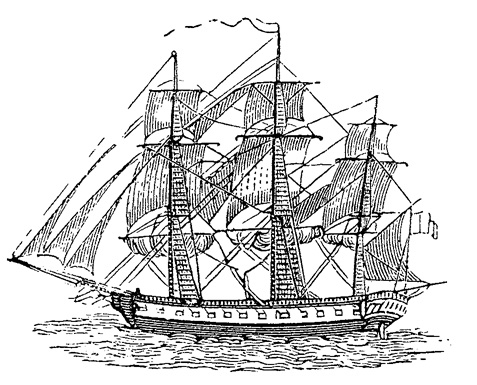 Jesse’s brother Christopher left Rhode Island in the late 1700’s for Pittstown, Rensselaer, New York. He became the father of numerous children and he and his children are quite well documented. 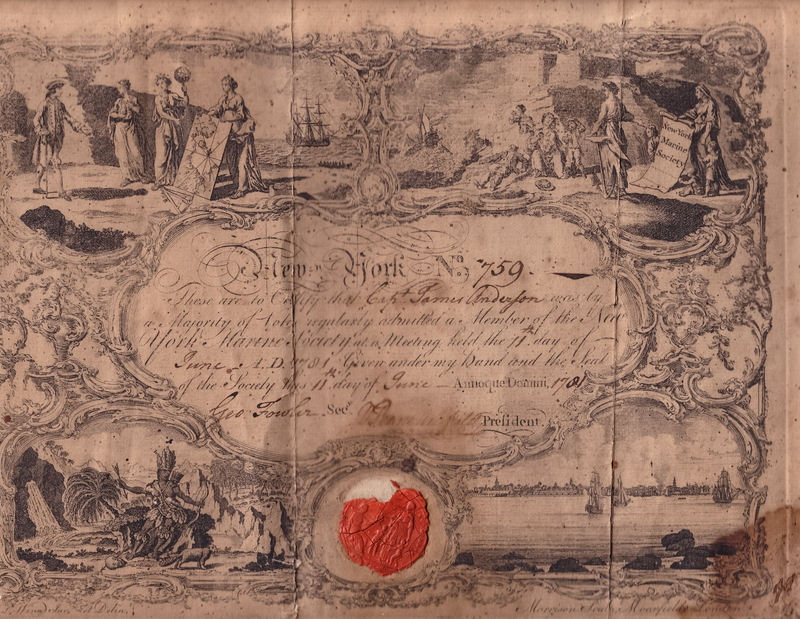 Jesse had a Seaman’s Protection Certificate issued in 1798 and served on the Brig Fanny out of Providence in 1799. Jesse appeared with a growing family in the 1800 and 1810 census in Warwick, then disappeared. Not really knowing Sarah’s exact Arnold family and possible connections, I did an extensive census match-up between Warwick in 1810 and Ashford in 1820 to see if anyone might have accompanied them (A Census of the Census and 9 Other Things I Tried). Nothing came of that. All of this was helpful, but didn’t prove that the family in Warwick was the same as the family in Ashford. Then I decided to get some DNA testing done on both my parents. Mom’s test came up with dozens of close matches to either Christopher Andrews (Jesse’s brother) or other Andrews of Warwick and East Greenwich, as well as the local families they tended to intermarry with – Sweets, Mattisons, Arnolds, Greenes. Mom has no other connections in this part of Rhode Island. It can really only come from Hannah Andrews. I’m going to continue testing with other companies, but I’m accepting this evidence at this point. 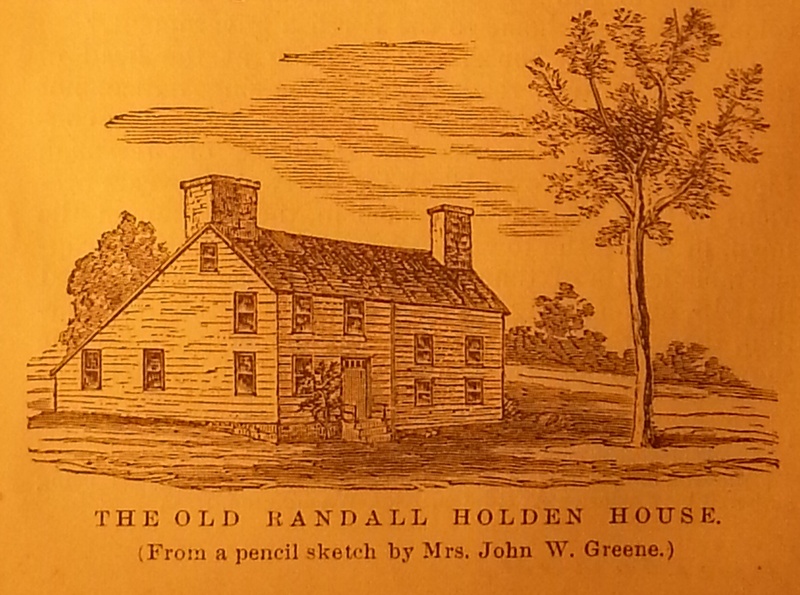 The Old Randall Holden House, from History of Warwick by Fuller. Randall Holden is a possible ancestor, depending on the exact Arnold line I may discover for Sarah. Hannah and Russell were married by a Rev. Joel R. Arnold of the Colchester Conn. church, a popular preacher who didn’t stay long. Now I am wondering if he is related to Sarah. Duh. Arnold. That’s just occurring to me. What happened between 1810 and 1820? If they were in Massachusetts, where? I find no evidence in deeds, many of which are actually online. I see other relatives heading to Vermont or New York, but I never see anyone else going to Massachusetts. Nearby Massachusetts should be a possibility (just north of Ashford, maybe) but I can’t find any record. Perhaps Jesse’s mother died, and he had a small inheritance, and went elsewhere to buy land. But I can’t find it. I read Warwick town records for this decade, thinking they may have thrown him out, or paid him for something, but no luck. The name Alden – where did that come from? None of these Arnolds or Andrews had Mayflower roots. Sarah Arnold’s parents will have to be discovered among the early Warwick Arnolds. Her birth was not recorded, so she may have been in a family that migrated from one town to another, perhaps recording only part of their family. My biggest clue is the proximity of Joseph Arnold to Jesse Andrews in the census records. While I don’t think there are marked graves for Jesse and Sarah, I at least would like to find some notice of their deaths. 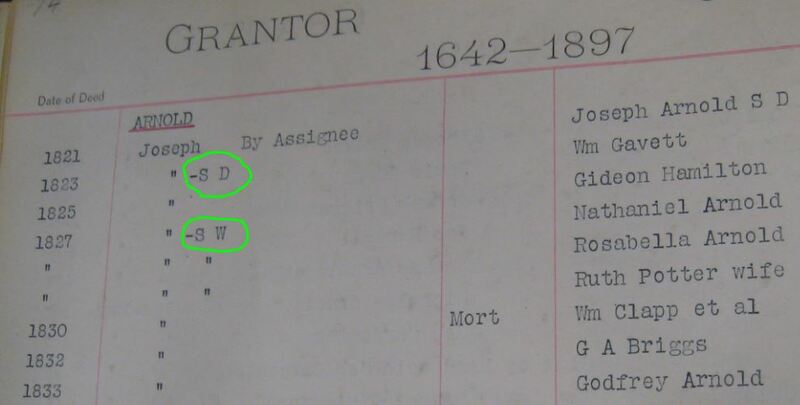 I have a theory that the missing children for Jesse and Sarah Andrews in the 1830 Ashford census may have headed south to Norwich, with their older siblings, to work in mills or do piecework at home. Hannah could really only have met Russell in Norwich. There were many other children in the Warwick 1810 census whose names are not known to me – what became of them? I see little clear evidence in Warwick, Ashford, or Norwich. It is embarrassing that I only have first name/middle initials for 4 of Hannah’s 5 children. I normally do much better than that. In Sarah’s case, I sought out her grave and cemetery records, and I certainly sought and sometimes found marriage and death records for all. If any of their descendants read this, please, let me know if you know one. Now that I have the DNA bug, I’m a little curious about what the DNA of Alden’s descendants might tell us. I don’t know any of them, but for his oldest son Russell, in particular, I have a lot of leads. In the meantime, yay. I found my ancestors right in my own backyard. Much more research will follow. Hannah saw a lot in her 59 years. She was born in a town that was new to her family, moved at least once or twice, and may have been part of the workforce at an early age. I suspect when she met her husband he seemed far above her in station, and I am quite sure he was a very smart man, a sort of self-educated engineer. Not much transpired after marriage that was easy or particularly successful, but I have in mind a version of her life where she admires her smart and ambitious husband, is appreciated for her willingness to follow him south, weathers very difficult times during the war, tends her children until, at the end, they must tend her, and is sincerely mourned. Rest in peace. 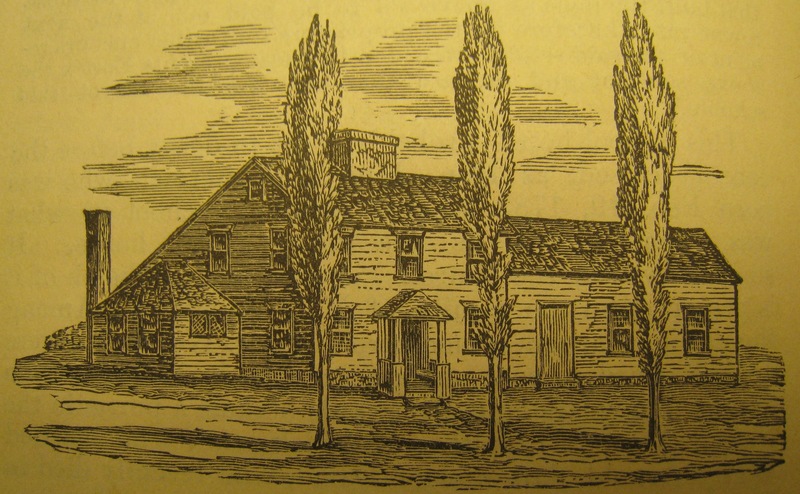 I recently discovered that the Peleg Arnold Tavern in Union Village, Smithfield, Rhode Island, was inherited by Peleg Arnold from his father, my 8th great grandfather, Thomas Arnold. After my recent trip to Central Falls City Hall, I read the will, administration papers and inventory of Thomas Arnold’s father, Thomas Arnold Sr (1705-1765) on page 481-498 of volume 2 (1749-1768). Thomas Arnold Sr (sometimes called Thomas Arnold, Esq or Lieut. Thomas Arnold) was my 8th great grandfather. seven with third wife Patience Cook, of whom only one was a boy, Peleg. 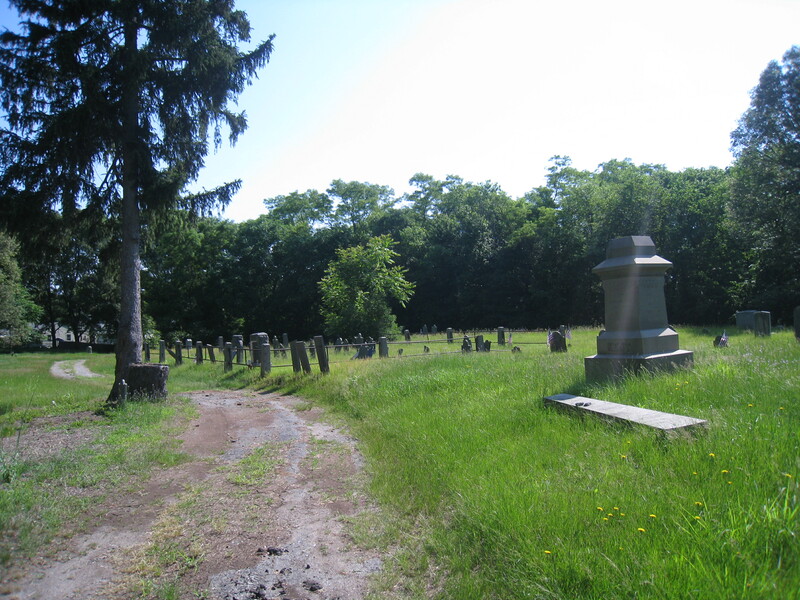 Also 2 acres of cedar swamp in Smithfield to his grandson “Assa Arnold” second son of his son Thomas (I have to believe this is because he was the namesake of the son who died very young) and various legacies to the daughters. Also, to wife Patience, “the best feather bed and furniture and all the rest of my personal estate” not otherwise disposed of. The first page of the $1399 personal effects inventory of Thomas Arnold Sr’s estate. Everyone in town owed him money, seemingly. The next few pages document a wide assortment of fancy household goods, farm animals and implements. I can’t help but feel this plan favored the third family of children, and widow Patience, although it’s possible the two older sons had been given significant property earlier (although I don’t see that in deeds) or that the remainder was more than I think. I do like, however, how this will gave far more independence to the widow Patience than what I have typically seen in my ancestors’ wills from this period. Thomas Arnold, Sr was leaving her with seven children under age 16. He must have admired and trusted her to leave her with so much autonomy, and I like that he was capable of that. Sometimes, widows were moved to one room in their own house, many possessions were auctioned off, a guardian was appointed for the children (I only see a provision here that a guardian be appointed if Patience died) and a son and his family took over the rest. Not so in this case. Reading this will, I finally put together something I should have figured out long ago. I knew about the Peleg Arnold Tavern, where the third son Peleg maintained a headquarters for Revolutionary War activities, kept a tavern business and practised law. I know that Peleg eventually lived in a more elegant house nearby, served in the Continental Congress, founded a bank and an anti-slavery society, and was later Chief Justice of the R.I. Supreme Court. Given his many accomplishments, and being one of the younger children, it just didn’t occur to me that he had inherited the tavern from his father. Now, looking it up, I see in The History of Woonsocket (E. Richardson, 1876) that Thomas Arnold Sr had a tavern license as early as 1739. He had inherited the house from his father, Richard Arnold. On page 42 Richardson mentions that the house was built by 1690, and passed from Richard to Thomas, Sr in 1731, comprising 60 acres. 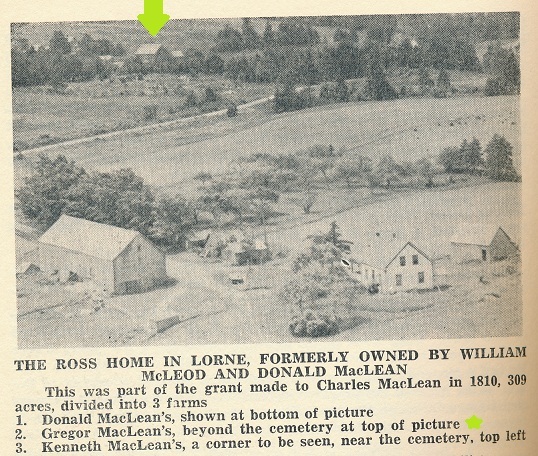 Thomas Sr had been the third of six sons, but he had inherited the family homestead, possibly because two of Richard Arnold’s sons had left their families by 1737. This also helps me focus on the Union Village area (now part of North Smithfield) as the likely location of most of Thomas Arnold Jr’s real estate. And I also learned that Thomas Arnold Sr. had a wider range of costly belongings than I would have expected. 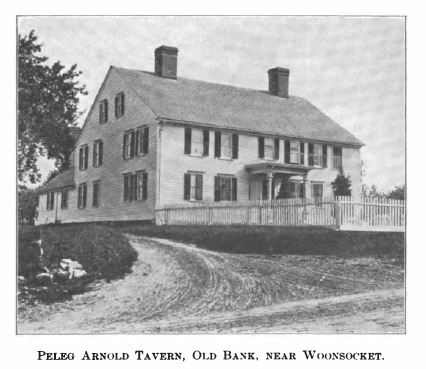 Peleg Arnold Tavern from State of Rhode Island and Providence Plantations at the End of the Century by Edward Field, vol. 3, 1902, p. 646. The “Old Bank” neighborhood, also called Union Village, was named for a bank Peleg, with others, founded. Richard Arnold (1666-1745) (m. Mary Woodward) my 9x-great grandfather owned the land and had inherited it from his own father, Richard. According to Richardson, Woonsocket, p. 41, the land Richard inherited began “at the Union Village and extending westward.” Richard started some businesses and increased his holdings during his lifetime. Apparently around 1690 he built the house, a square, compact home; in his father’s will of 1710 he gained complete ownership of the property. Thomas Arnold Sr (1705-1765) (m. 3times , see above) my 8x-great grandfather inherited the property from his father Richard. Thomas Arnold was a military leader, tavern keeper, and he practised law in some manner or other. In his Providence Gazette death notice he is called “Judge Thomas Arnold” (Arnold’s Vital Records, vol. 13, p. 133). He had a tavern license by 1739, however I am not certain the tavern business was in continuous operation after that. Thomas is buried in Union Cemetery, Smithfield, not too far from his home. I have written about his grave here. I am related to Thomas through his son, Thomas Arnold – Lucy (Arnold) Ballou – Marcy (Ballou) Aldrich – Nancy (Aldrich) Darling – Ellis Darling – Addison P. Darling – Russell Darling – my grandmother Edna Darling. Peleg Arnold (1751-1820) (M. Alpha Arnold, no children) my 7th great grand uncle inherited the house, according to his father Thomas’ 1765 will, when he became 21, which would have been around 1772. He married Alpha Arnold in 1768. According to Richardson (Woonsocket, p. 71) Peleg enlarged the tavern around 1780 (“when it again became a tavern”). 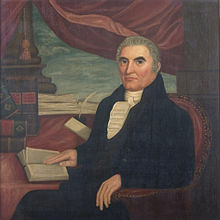 He studied law at Brown University, was active in military and government roles, and served in the Continental Congress during the time that Rhode Island was slow in ratifying the new U.S. Constitution. He was interested in educational, anti-slavery, and political matters and, according to some of the older books, was fond of rum. Today, it still exists in Union Village, near Great Road on Woonsocket Hill Road, and has been divided into apartments since the 1940’s. The house today. Photo by Diane Boumenot. During his service in the Continental Congress, Peleg wrote back to his “father” Stephen Arnold (actually his father in law, Alpha’s father) about some home matters. The letter gives an indication that they were close and that he looked to Stephen to help his widowed mother with some decisions about the farm. I have to smile that he mentioned to his wife’s father that he expected a letter from her once a week during his absence. Perhaps she needed some reminding. Honoured Sir, New York 25th May 1788. I imbrace this oppertunity to acknowledge my Regard for your Self and Famaly. The many favors I have received from you Impresses my mind with a grateful Sense of acknowledgement. I have no cause to doubt but your care will further Extend to my Famaly. I Desire you to assist them in my absence with your advice in Farming & Disposing of Such part of the Stock of Sheep & C—;—; as may be Necessary. (Letters of Delegates to Congress: Volume 25 March 1, 1788-December 31, 1789 –Peleg Arnold to Stephen Arnold, on the website A Century of Lawmaking for a New Nation: U.S. Congressional Documents and Debates, 1774-1875). As many Rhode Island researchers know, the records of old Smithfield, Rhode Island are located in the Central Falls City Hall. Smithfield was a very early settlement, but grew into many towns, and at some point the early records were placed for permanent storage in Central Falls, and each town has their own more recent records. I visited there recently, at 580 Broad Street in the tiny city of Central Falls. 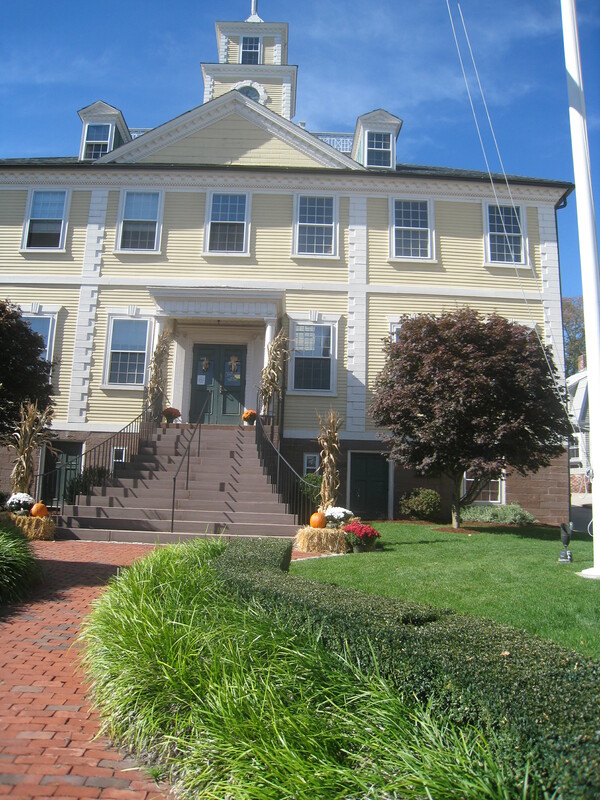 It was a typical (for Rhode Island) turn-of-the-last-century city hall, and in fact it is on the same street as the nearby Cumberland Town Hall. 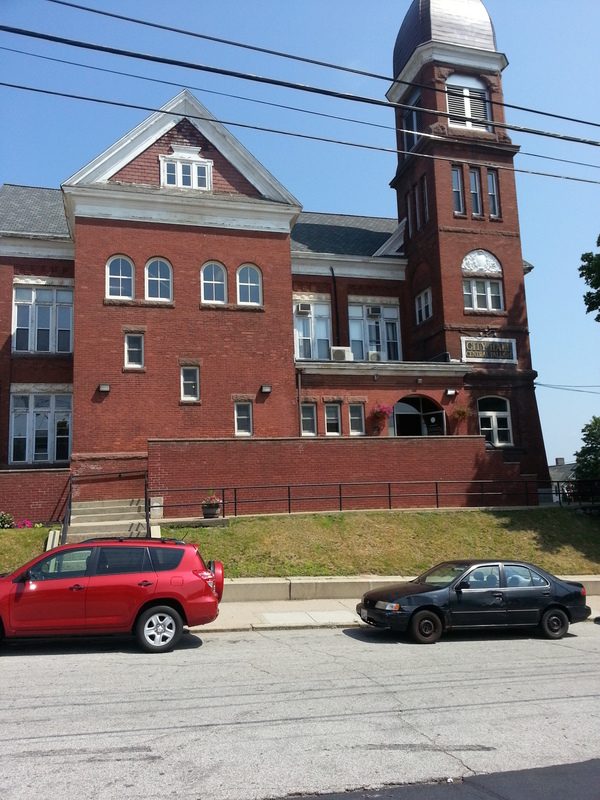 Central Falls City Hall, seen from the side. Like many city halls, it has no real parking, and also is in a popular and crowded neighborhood – in this case, it is next to a busy small park. I was puzzled about parking but finally realized there were one or two unoccupied spots next to the building, on the street (that would be across the side street from the Dunkin Donuts … you will know you’ve reached Rhode Island if there’s a coffee shop on every corner). The city clerk’s office was easy to find on the first floor and I thought the staff person who helped me was among the most professional and knowledgeable I have encountered. I was quickly led into a room filled with the old books and records, with a couple of tables and chairs. During my stay I encountered a few other visitors, but as in most town halls, they seemed to be strictly doing title or other legal research as quickly as possible, and moving on. The room with the old records. To one side, there are some tables and chairs. The room was neat and spacious and well organized. I had seen many records on microfilm during a trip to the Family History Library in 2013, so I was there to get a sense of what records were available, to evaluate the indexing, and to do some specific lookups. Handwritten index pages can be hard to read, so I wanted to photograph some pages and return another time with a list of records I wanted to find. Vital records are just inside the door. 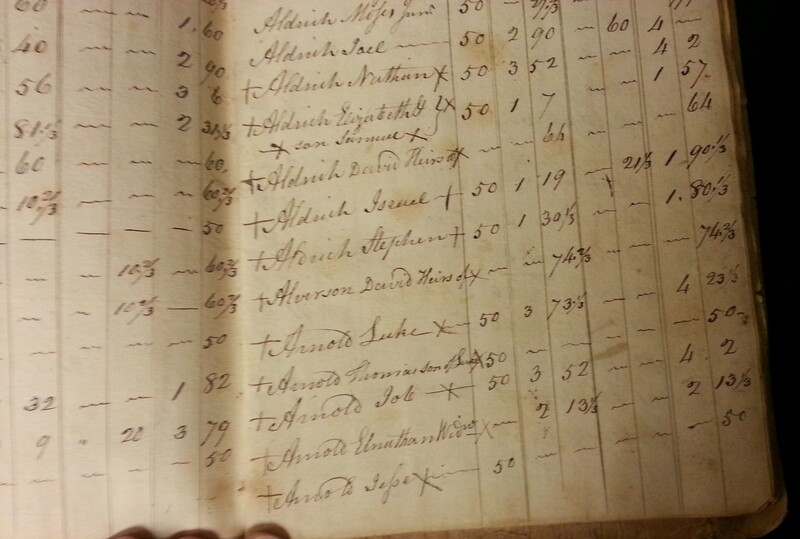 Seeing these in person finally helped me to realize that since they start in 1730, and the information I am seeking (a family for Rachel Arnold) would be be from the 1730’s or earlier, I should also be be looking at the prior repository. I think that would be Providence City Archives. What surprised me about the vital records was that some early pages were damaged or worn at some point in their history. They are carefully encased now for protection, but it’s obvious that at some point they incurred some damage. 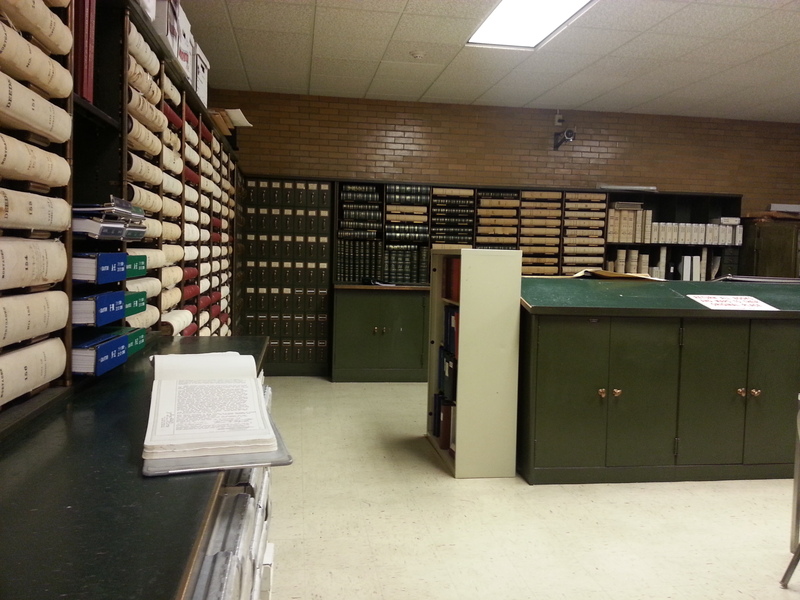 I was very interested in finding probate records. I have never found any death or probate information for Thomas Arnold. 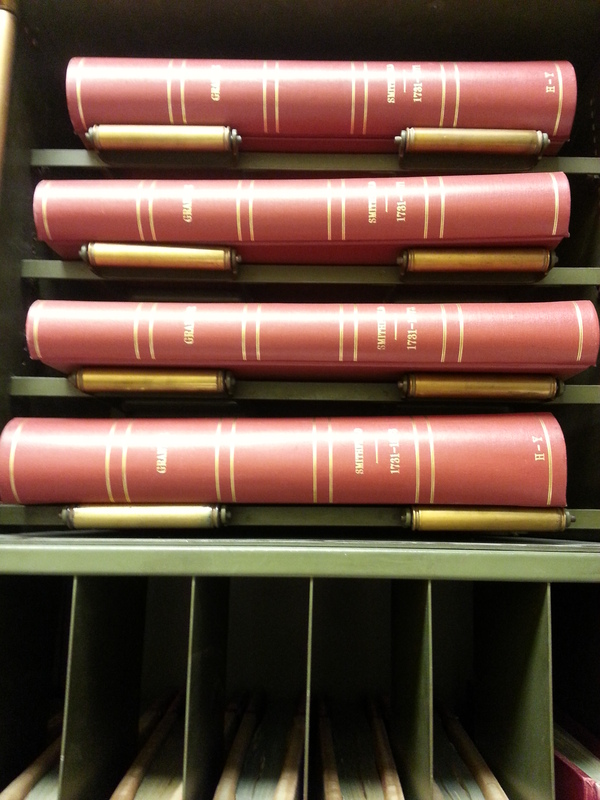 I found the Probate volumes and was told the index to each volume could be found at the front. For the early volumes I was using, that was not true, but eventually I found index pages towards the back – so scanty and mixed in with the final volume pages that I had missed them at first. The pages are safely bound now to prevent further damage. I photographed the index pages for study at home. Given the state of the index, without a page-by-page perusal, it would be hard to be absolutely sure what was in the probate records. The only place I know of with a more recently compiled index to Smithfield Wills is the Rhode Island Genealogical Register, volume 16. That has not helped me. I did find the will, administration papers and inventory of Thomas Arnold’s father, Thomas Arnold Esq (1705-1765) on page 481-498 of volume 2 (1749-1768). I learned something about my family that I did not know before; there will be a future blog post about The Peleg Arnold Tavern. There were index volumes for grantors and grantees. 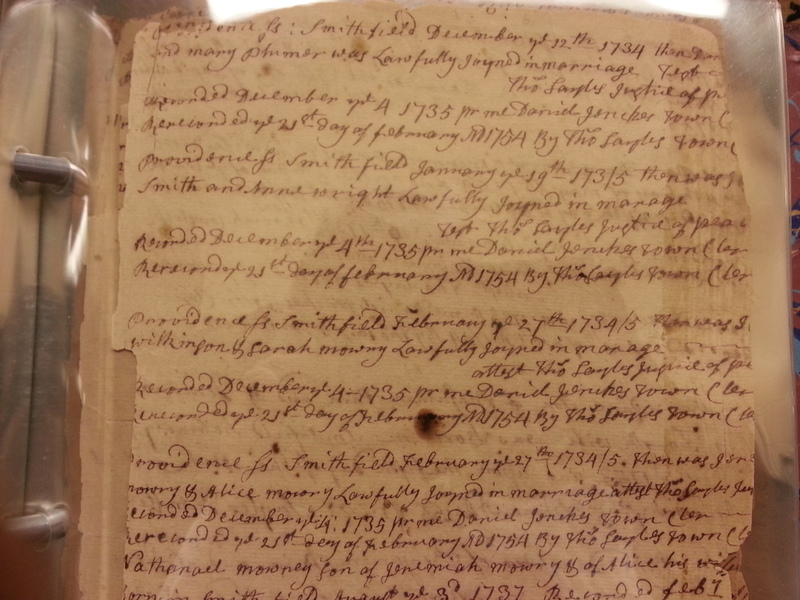 I checked the index for the 1762 John & Mary Smith/Thomas Arnold Jr deed that I wanted to photograph. 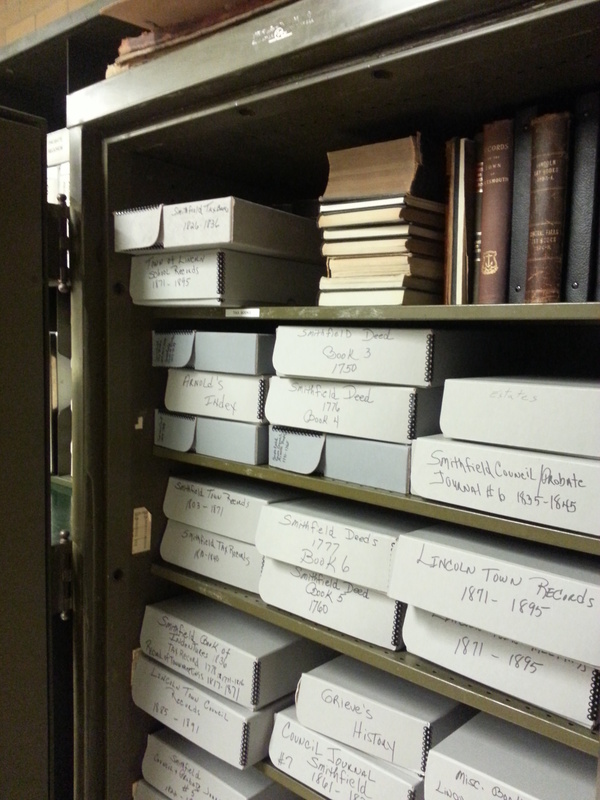 I had to inquire where volume 6 of the Smithfield deeds were; turns out they were in the metal cupboard. I photographed the deed for careful study later. I am hoping this John and Mary Smith could possibly be Rachel’s parents. I had also photographed a probate record for the only possible John Smith I could find in the records. I explored the cabinet a bit and found an old tax booklet (1803), and a neighborhood by neighborhood Surveyors List from 1814. All in all, I enjoyed getting to know the old Smithfield records and I will be returning soon. I haven’t yet looked at many town council records or recorded all the vital records I need. 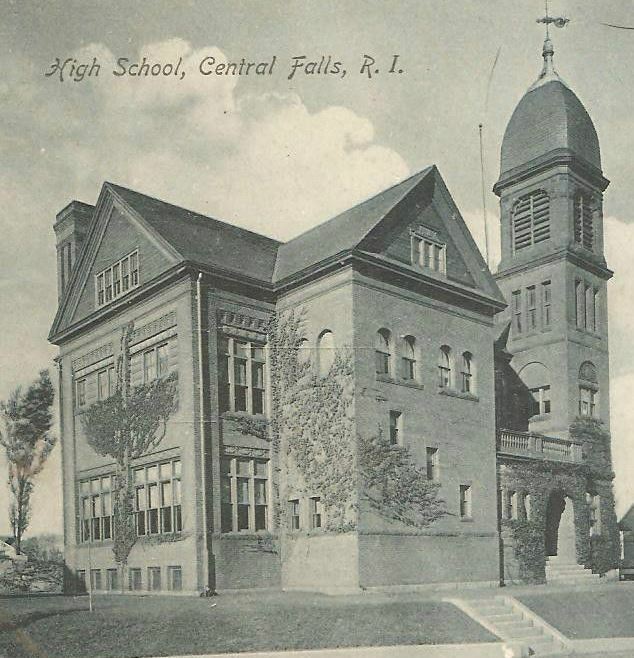 This old postcard from 1906 makes it clear that City Hall was once a high school. First of all let me say I am no expert on the Rhode Island Arnolds. But until you find one, here is what I know about them. Of all the email I get, a good 25% contains questions about the Arnolds, so I’m putting some thoughts down here. The Smithfield Arnolds (Thomas Arnold). Early descendants tend to be in Providence or north of Providence. the Pawtuxet/Warwick Arnolds (William Arnold). Early descendants tend to be south of Providence. 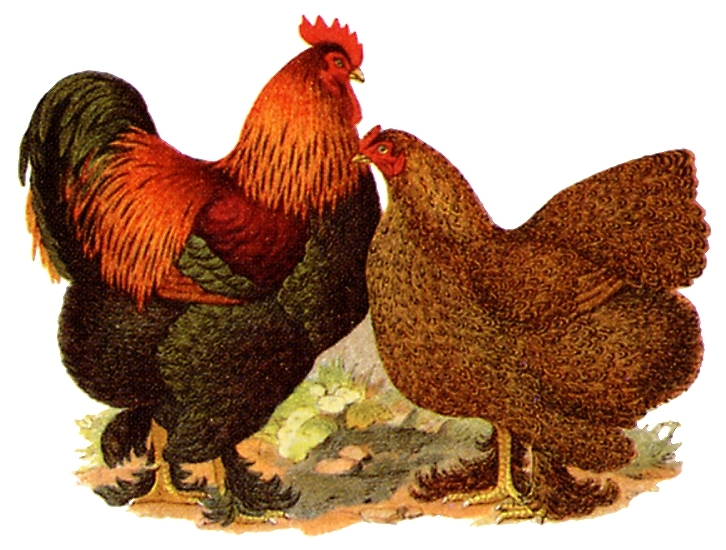 I am descended from the Smithfield Arnolds, with a possible unproven connection to the Pawtuxet/Warwick Arnolds. My Smithfield Arnold line of descent is: my grandmother Edna May Darling – her father Russell Earl Darling (1883-1959) – Addison Parmenter Darling (1856-1933) – Ellis Aldrich Darling (1824-1883) – Nancy Ann Aldrich (1800-1879) – Marcy Ballou (1778 – ?) – Lucy Arnold (c1755 – ?) – Thomas Arnold (1733-1798) – Thomas Arnold (1705-1765) – Richard Arnold (1660-1745) – Richard Arnold (1643-1710) – Thomas Arnold (1600 – 1674). Descendants of Thomas Arnold of Smithfield, Rhode Island are in luck, because some excellent work has been done on this line by noted genealogist Richard H. Benson, The Arnold Family of Smithfield, Rhode Island (2009). If you are tracing your genealogy and you think you are descended in this family, you should own this book, or at the very least, borrow it through interlibrary-loan at your local library and study it carefully. Benson begins with a review of the misconception that William and Thomas were brothers, or otherwise closely related. That idea is based on a rather spectacular failure in 1870’s genealogy – a genealogist was hired to do research in England, and returned with an appealing and mostly faked report. This misinformation was repeated for a couple decades, then disproved. My recommendation to anyone researching Arnolds in Rhode Island is to treat the two families separately, and ignore any implication – in older, otherwise dependable works – that there was a relationship. 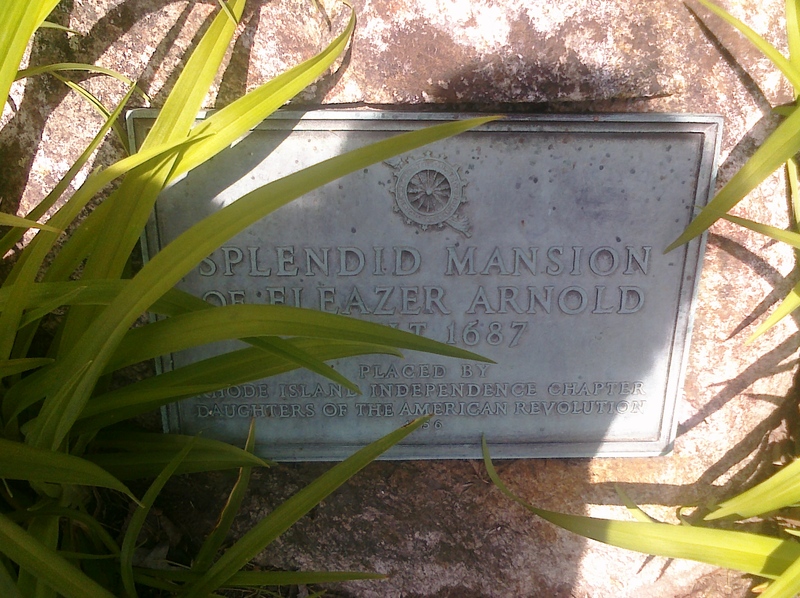 Eleazer Arnold (1651 – 1722), son of the original settler Thomas, whose large “Splendid Mansion” house survives today in Lincoln (formerly Smithfield), Rhode Island and is known as the Eleazer Arnold House. 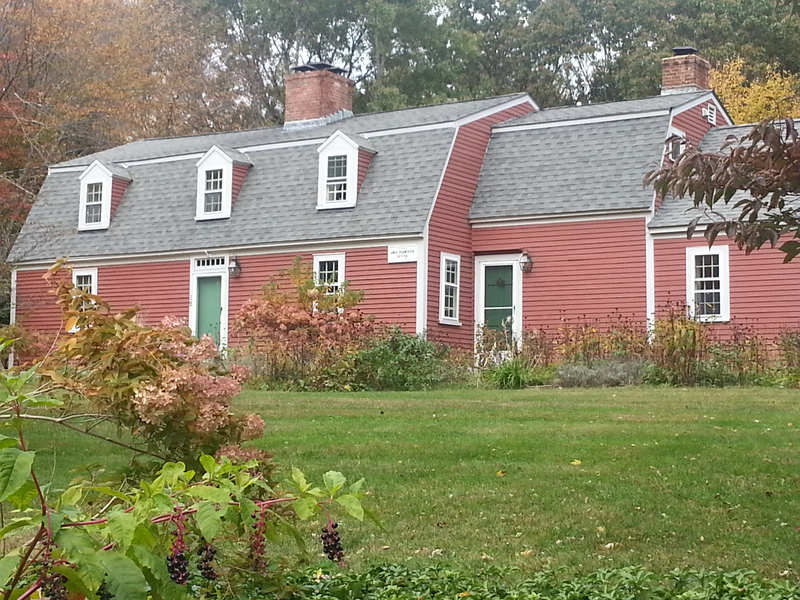 Eleazer Arnold and others helped to build an early Quaker meeting house nearby. The first few generations of this family tended to be Quakers. William Arnold was a contemporary of Roger Williams, and settled in an area south of Providence, along the bay, called Pawtuxet (now part of Warwick and Cranston). Unlike many early English settlers, he actually brought documentation with him of his family’s vital records back in England. So genealogically speaking, the family was off to a good start. William prospered, and accumulated significant property. There is more about William’s life on Wikipedia. His son Benedict became the first Governor of the State of Rhode Island. 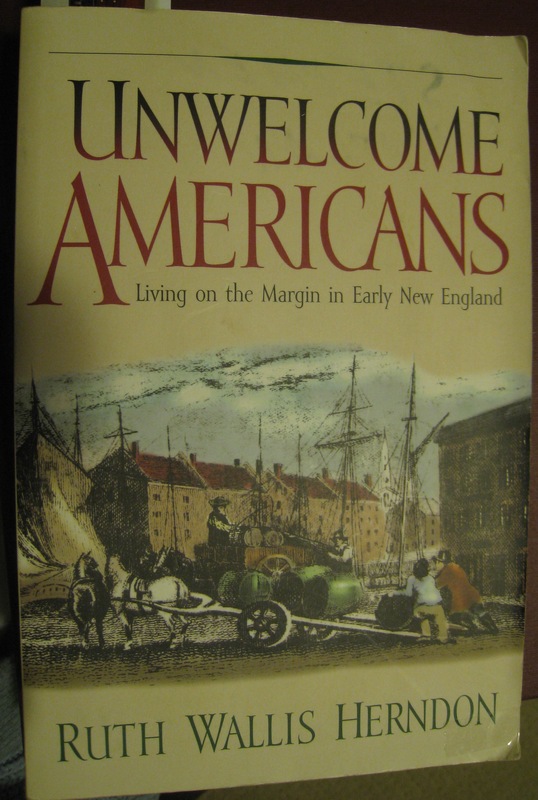 Proud, perhaps, of that name, there were an additional four succeeding generations in a direct line that carried the name, leading to Benedict Arnold, born 1741 in Norwich, Connecticut. I suppose, rightly or wrongly, most Americans do not feel sympathetic to Benedict Arnold, the American Revolutionary War military officer who became discontented with his lot and transferred his allegiance to the British, and fought on the other side. As familiar as the name is today, and as despised as it is, I think feelings ran even higher in the 19th century. 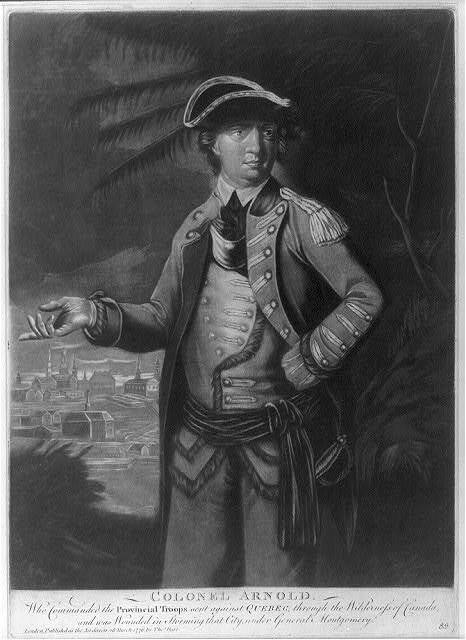 Benedict Arnold, as an American Colonel. London : Published by Thos. Hart, 1776. Courtesy of Library of Congress LC-USZ62-39570. This leads me to the reason I personally am very angry with Benedict Arnold. 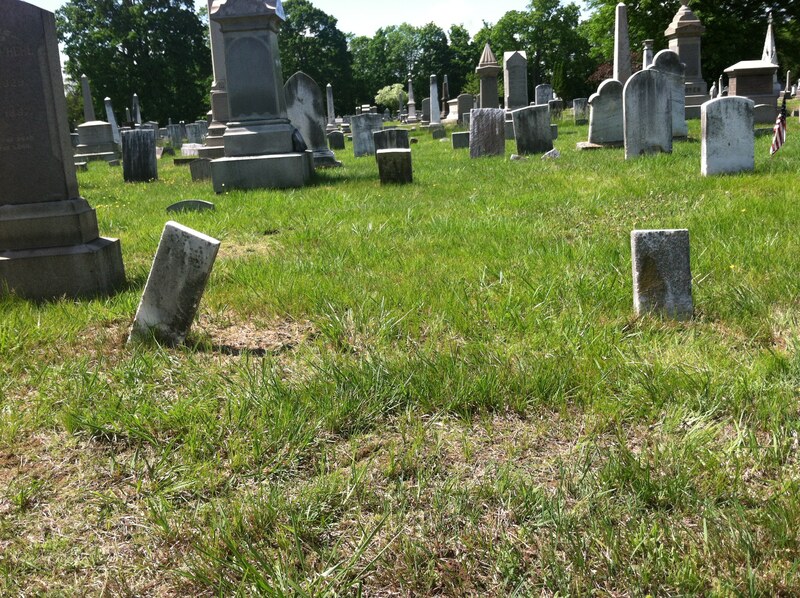 In the 19th century, Rhode Island was the home of one of New England’s leading genealogists, a pioneer in the field, the person responsible for a great deal of the early work on Rhode Island vital records and cemetery transcription. James Newell Arnold founded a genealogy journal, The Narragansett Historical Register, produced the 21-volume Vital Record of Rhode Island, and performed some similar work in nearby states. Why didn’t James N. Arnold produce a definitive genealogy of the Arnolds, including the William Arnold descendants? I mean, the index cards were probably sitting right there in his undoubtedly crowded and dusty genealogy study. I have only begun to explore his manuscripts, but there certainly was no published compiled genealogy. I have a suspicion that he might have neglected this because he didn’t want to admit his kinship with Benedict Arnold. 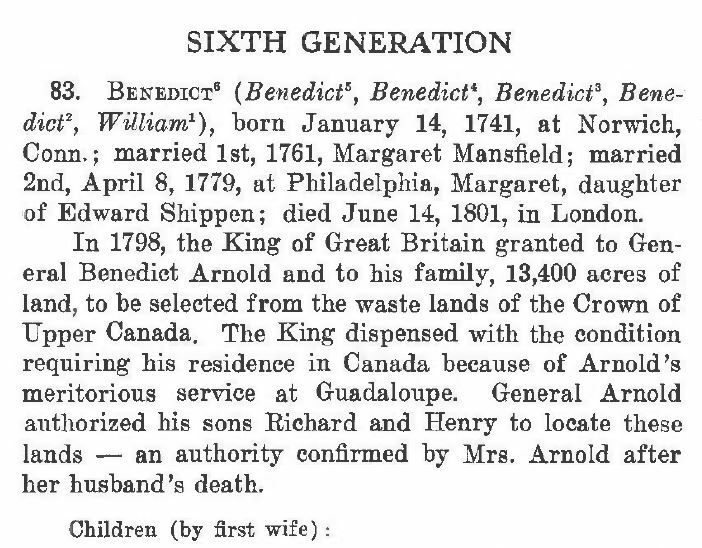 My suspicion is based on a remark of his that I read years ago and failed to record (I had no idea I was related to the Arnolds then) claiming that Benedict was absolutely not descended from any Rhode Island Arnolds. Although I suppose it’s possible he was fascinated with collecting and editing information, not so much with analyzing and compiling it. I wonder if I will ever figure this out? For a slight indication of the spirit of denial, this is from the index of my digital copy of the 1935 book “The Arnold Memorial” by Elisha Stephen Arnold (marked as a “Genealogical Society of Utah” copy). Which Benedict Arnold appears on page 132? The page ends with a list of his children. It’s a bizarre rendition of the life of traitor Benedict Arnold which, I should think, fooled no one. 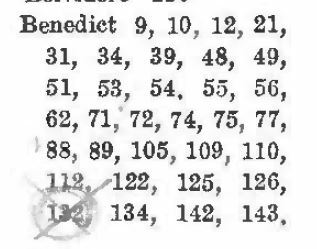 I wonder if the crossed-out index entry was meant to deny that this Benedict belonged in this lineage, or to simply express displeasure at his existence. So, lacking the truly good work we could have had from James N. Arnold, we must turn instead to a variety of inadequate compiled genealogies on the William Arnold descendants. They are listed at the bottom of this page. The books tend to focus on the wealthier descendants – perhaps that is by necessity, since Warwick vital records are far more complete among well to do families, and there are more probate and real estate records for such families, or perhaps it is somewhat intentional. Because of that original documentation by William Arnold and a few generations of his descendants, the early genealogy is quite complete. It’s the later generations that get spotty. In each of the two Arnold families, there was of course a great deal of intermarriage with the other early local settlers in that region. For the Smithfield Arnolds, this means the Comstocks, Smiths, Ballous, Whipples, Steeres, Aldriches, Buffums, Manns, and Inmans. 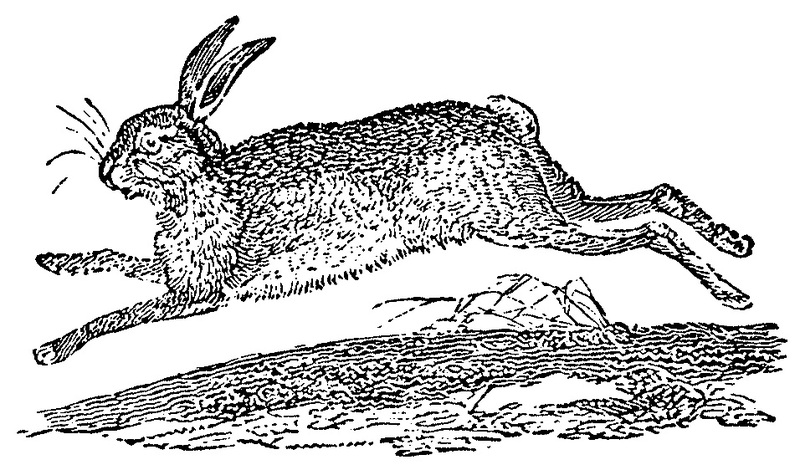 If you descend from these Arnolds, you have interesting ancestors in the other lines, too. Remember that what was originally Smithfield is now Smithfield, North Smithfield, Lincoln, Greeneville, Cumberland, and Woonsocket. 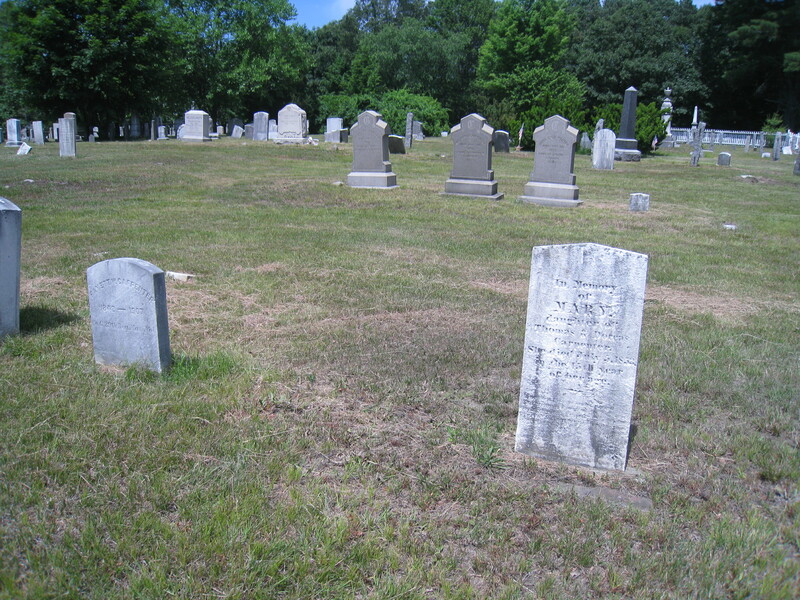 My Arnold ancestors lived at one point in Union Village, North Smithfield, and some of their graves are at the Union Cemetery. For the Pawtuxet/Warwick Arnolds, there was intermarriage with the Greenes, Gortons, Holdens, Wickes, Westcotts, Rhodes, and Carpenters. Settlement of Warwick spread quickly to the south and west of Pawtuxet and eventually the towns of West Warwick and Coventry were split off. Cranston was nearby on the north and East Greenwich on the south. Certainly, for descendants, a visit to the village of Pawtuxet is in order, plus the Warwick Historical Society which is located up the road in the John Waterman Arnold House. In the beginning, Warwick and Smithfield held agricultural settlements which grew out of Providence, with accompanying forges, grain mills, etc. But around 1800 small textile mills began to spring up around Rhode Island’s rivers and streams. Both locations were impacted, resulting in mill towns like Woonsocket and West Warwick. Although there is less manufacturing going on in those locations today, many of Rhode Island’s towns show remnants of many overlapping historical eras – several centuries of growth and change. Surprisingly, even the late 1600’s era can be glimpsed from time to time along the bay, in rural areas like northern Cumberland and western Coventry, in historic cities such as Newport, and in the many small historic sites such as Smith’s Castle in North Kingstown. If you have a mystery in this line, you are welcome to leave a query here in the comments. Perhaps someone else will have an answer. But please also use the sources I’ve listed below and the “Free Rhode Island Resources” link up top to see what you can find, as well as many other research strategies. Perhaps you could add a few sources that you know of in the comments. The Arnolds are not easy to research; there are a LOT of them, and many other early families in other states. Good luck!! Benson, Richard H. The Arnold Family of Smithfield, Rhode Island. Boston: Newbury Street Press, 2009. Available for sale on the NEHGS web site. “Eleazer Arnold” by William Greene Roelker in Rhode Island History, vol. 11, no. 3, (July, 1952) p. 81 (picture of the house on cover). Available on this Rhode Island Historical society web page. Greene, Welcome Arnold. “Notes on Genealogy of the Arnold Family.” Providence: typescript, c1840 – 1914. 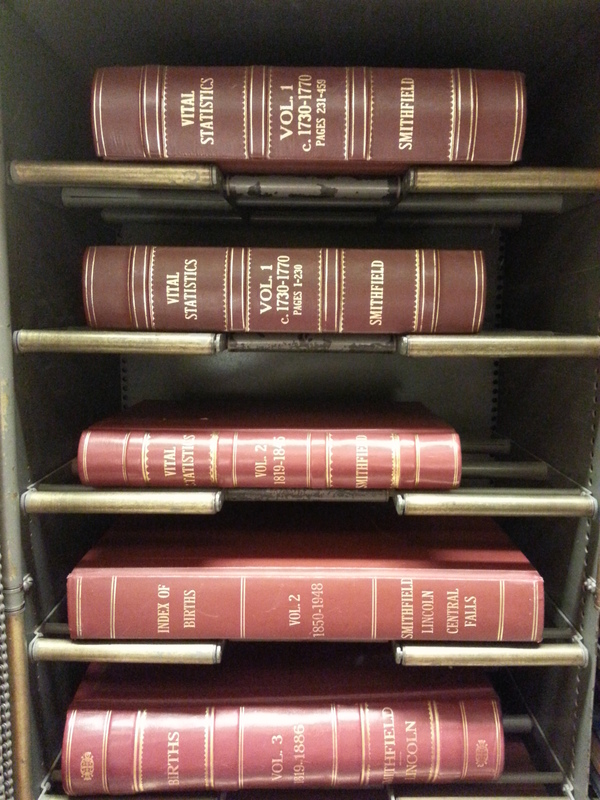 Located at Knight Memorial Library; paper copy available at New England Historic Genealogical Society Library, Boston. Richardson, E. History of Woonsocket. Woonsocket, R.I., 1876. Link opens the Archive.org pdf download. “Some Arnolds of Smithfield, R.I”. by H. Minot Pitmann in Rhode Island History, vol. 13, no. 4, (October, 1954) p. 111. Includes a correction to the “Eleazer Arnold” article. 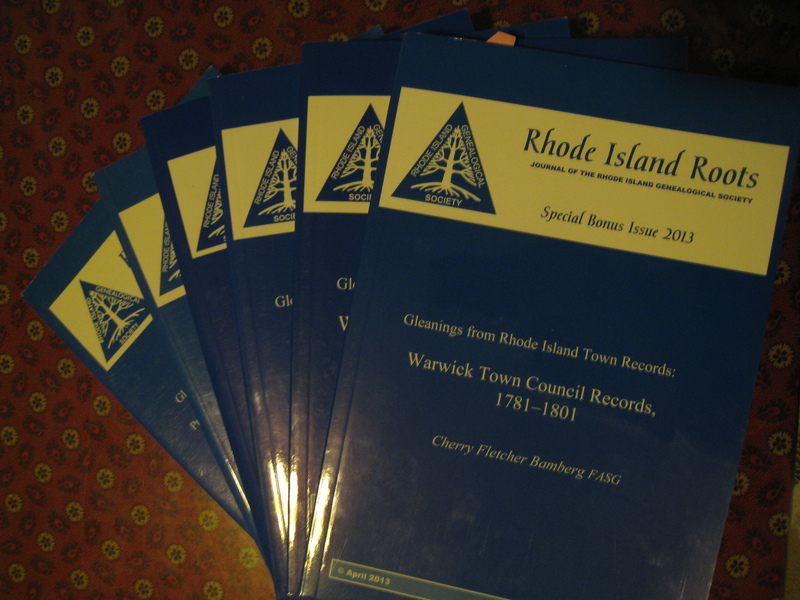 Available on this Rhode Island Historical society web page. Benedict Arnold Tavern, Warwick, demolished 1840. From page 144, Fuller’s History of Warwick, R.I.
Arnold, W.H. (William Hendrick). The Arnold Family. reprint Salem, Mass. : Higginson Book Co., 2002. 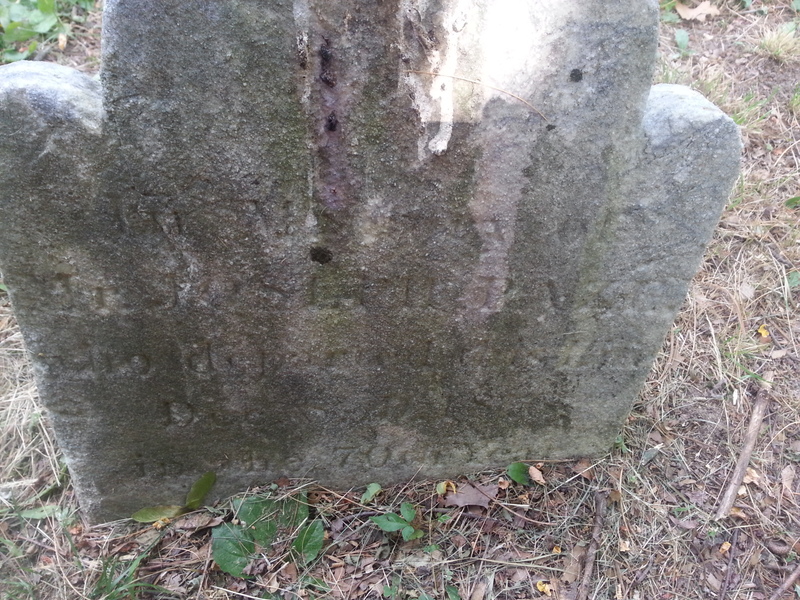 Looking for a link between the Jesse Andrews family of Warwick, R.I. of 1810 and the Jesse Andrews family of Ashford, CT, 1820 has required a lot of patience and thought. Here are 10 things I tried recently, and where they led me. The story of Jesse and wife Sarah, parents of my ggg-grandmother Hannah Andrews, was detailed here. My purpose is to find out what happened to the Warwick couple, and if they ended up in eastern Connecticut. Word of caution: I am related to Jesse and Sarah Andrews in Ashford, 1820. I am only related to the Warwick folks if they are the same people. Someday, I will know. A census of the census. My idea, here, was to take the population of the 1810 census in Warwick and compare it, name by name, to the population of Ashford in 1820. I wanted to see if others had migrated to Ashford, too. This was fairly easy to set up, I opened each census record in Ancestry.com, scrolled back to page one, and using the typed index at the bottom of the page, copied that text one page at a time. It was easy to just move the selected text to an open spreadsheet, with the mouse, and then move ahead to the next page of the census. This resulted in a total of about 1,100 names. I re-sorted the combined list and read it for duplicate first + last names that spanned the two places. There were 5: John Howard, Thomas Howard, William Howard, John Phillips, and John Smith. Fine, but I don’t know what to make of that. Inconclusive. Local history. I consulted Warwick’s Villages, Glimpses from the Past by Donald A. D’Amato (2009), The History of Warwick, Rhode Island by Oliver Payson Fuller (1875) and Edward Field’s State of Rhode Island and Providence Plantations at the end of the Century Volume 2 (1902) for more information about what was going on in Apponaug/Cowesett/East Greenwich around 1790-1820. 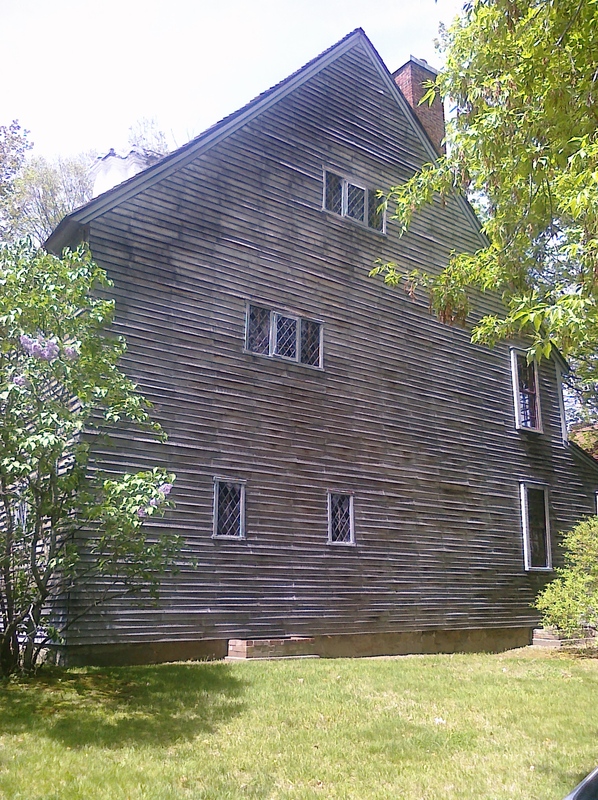 During this time some mills sprang up in Apponaug. 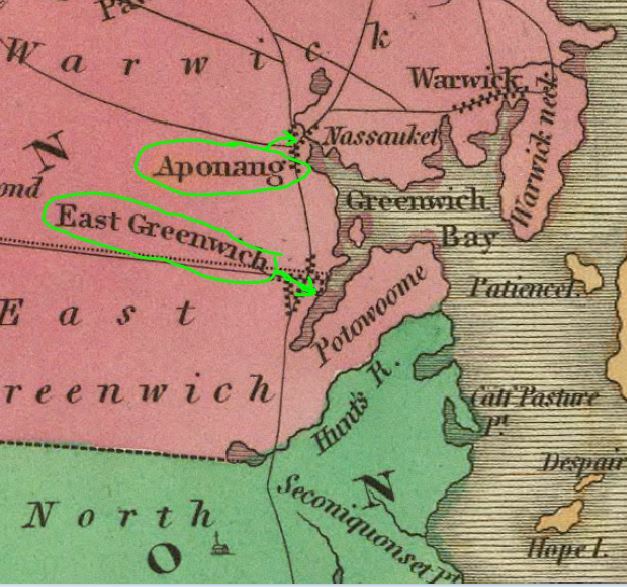 There was a minor port and shipyard in Apponaug Cove, and a slightly larger port in East Greenwich. As detailed in my last post, I know Jesse Andrews had a Seaman’s Certificate in 1798. Although I’ve only found one record of him shipping out internationally, in 1799, he may have worked in the shipyard or on local vessels. Other events during that time include the War of 1812 (no participation that I can see; Jesse was a little old for that), the Great Gale of 1815, and the financial panic of 1819. All of this could have driven them from their coastal life, inland, farming. Greenwich Bay, on west side of Narragansett Bay, leads to Apponaug and East Greenwich. The area in between is called Cowesett. Map by A. Finley, 1831. The 1798 Direct Tax, Rhode Island. As you can see on this Rhode Island Historical Society finding aid, “Direct Tax Records,” the federal government required the states in 1798 to compile “a particular list or description of each dwelling house” in order to create a tax assessment plan. The descriptions of the houses often covered size of the lot, dimensions of the house, number of windows, outbuildings, owner’s name, lessee’s name, etc. Luckily, Warwick is among the surviving records, which I viewed on microfilm. Since Jesse and Sarah married in 1795 in Warwick and were included in the 1800 census for Warwick I was hopeful that I would find them there. Alas, no, they were not in there, not even as tenants. There were no Andrews at all. But, if accurate, this lack of an entry may be telling me that Jesse and his bride were living with family, or living in nearby East Greenwich. 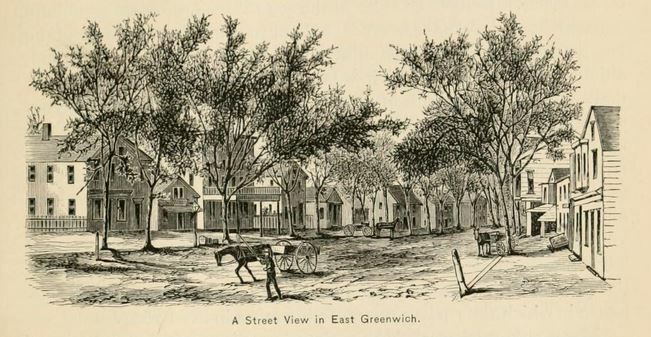 View of East Greenwich from the water. From Picturesque Rhode Island, W. Munro, 1881. Talking to a genealogy buddy. Another genealogist and I had a talk about the problem. She suggested that I should focus on the wife, Sarah. Sarah is the daughter of Joseph Arnold of Warwick, but there wereseveralJoseph Arnolds in Warwick in 1795, and no sign of a daughter Sarah among them. But somehow I need to pursue this anyway. So far I only have a probate record for one Joseph (not the right one), but need to pursue the others. I tried looking at deeds at the Warwick City Hall, but that was not too helpful. 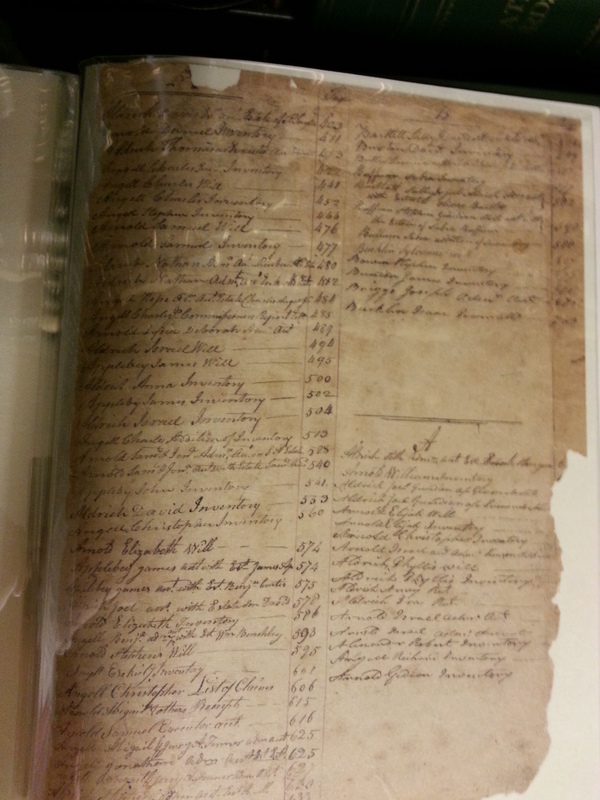 One of several pages of Joseph Arnold deeds indexed at Warwick City Hall. Note the “S.D.” and “S.W.” indicating “Son of D” and “Son of W”. That usage is common in Warwick. Not every deed has that, of course. Looking at Sarah’s father. It seems very likely that Sarah’s father, Joseph Arnold, was alive at the time her marriage was recorded in 1795 (because Jesse’s father was specifically listed as “deceased”). Joseph Arnold was a popular name in Warwick around this time. 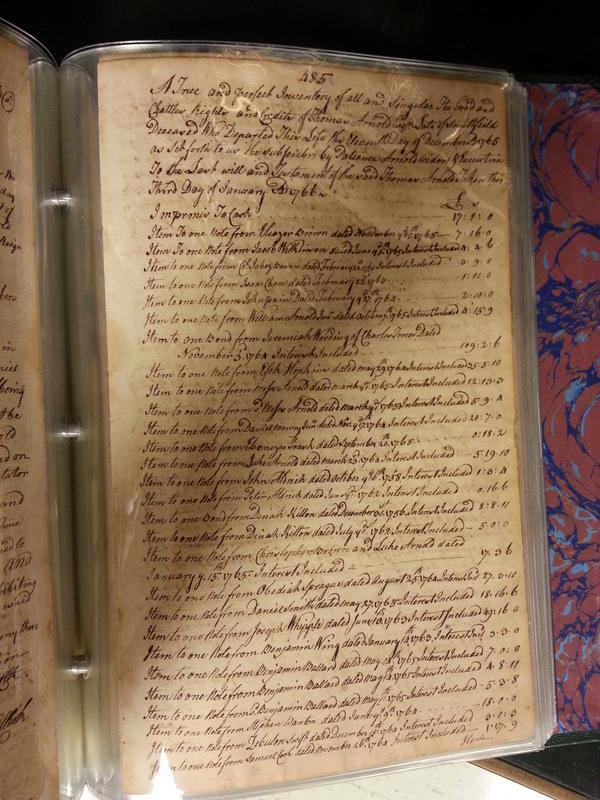 One Joseph Arnold paid for a tavern license each year, as shown in the Warwick town council records that I viewed in at City Hall. I think that may be the Joseph Arnold at Apponaug corners (see below), not the one I am looking for. Reviewing published genealogies – The Arnold Memorial and the William Arnold Outline are the works that pertain to the “Pawtuxet” Arnolds (both can be downloaded as pdf’s from the FamilySearch.org book section). I read each of these works entirely this time. I had been disheartened previously with the lack of a suitable Joseph/Sarah father/daughter match, but this time I realized that The Arnold Memorial is quite briefand concentrates mostly on wealthier Arnolds (for instance, through probate records). I realized that her absence from the book probably meant nothing. 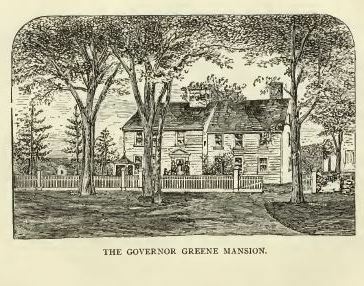 Governor Greene Mansion, located in Cowesett, from The History of Warwick, R.I. by Fuller, 1875. Maps. I found a map of the exact neighborhood and exact time period I wanted, that is, Apponaug 1805, on a website that no longer exists. And, more amazingly, it contained a sketch of a Joseph Arnold house. 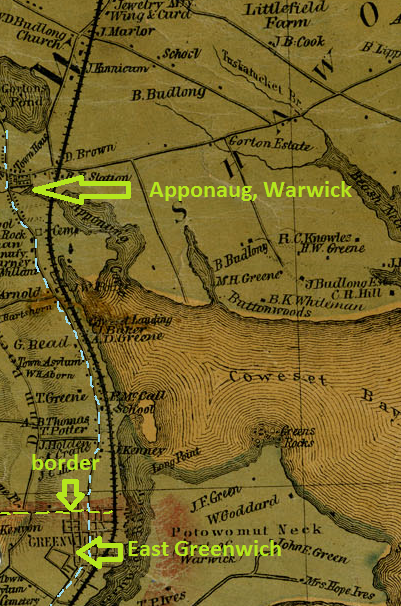 Putting together the details on the map, what I learned from The Arnold Memorial, and an examination of deeds at the Warwick City Hall, I was able to eliminate THAT Joseph Arnold and his son, Joseph Franklin Arnold. That was a big help. 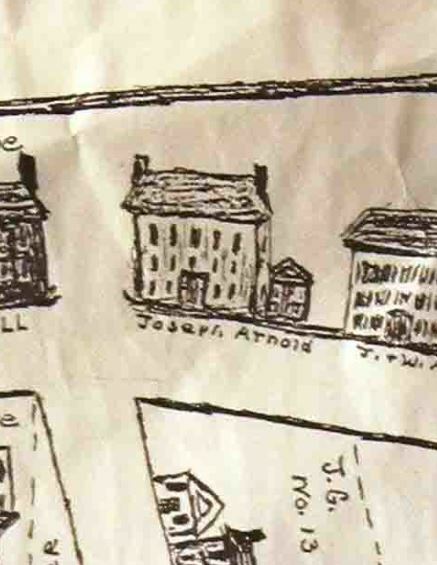 Snippet of the 1805 Apponaug map, showing the rather grand three story house of Joseph Arnold – the WRONG Joseph Arnold – on a busy intersection near where the city hall is today. 1790 – In East Greenwich, next to Jonathan Andrews, Whipple Andrews, and Joseph Card. Probably my most significant find to date, and I’ve been working hard on this for months. The Jonathan Andrews that had a son Whipple would have been the uncle of Jesse’s father, Philip (Jonathan and John Andrews were sons of Benoni Andrews). Joseph Card was the husband of Jesse’s aunt, Welthian (Philip Andrews’ sister). 1810 – In Warwick, there is a Joseph Arnold living right next door to Jesse Andrews. It seems like more than a coincidence, although it could possibly be a brother of Sarah’s, I suppose, instead of her father. Freelove Andrews appeared near him in several census records, and could possibly be his sister in law, Freelove (Rice) Andrews, if Jesse’s brother Christopher died young. Or, it could be Jesse’s mother, who was a widow, name unknown. Cemetery Maps. 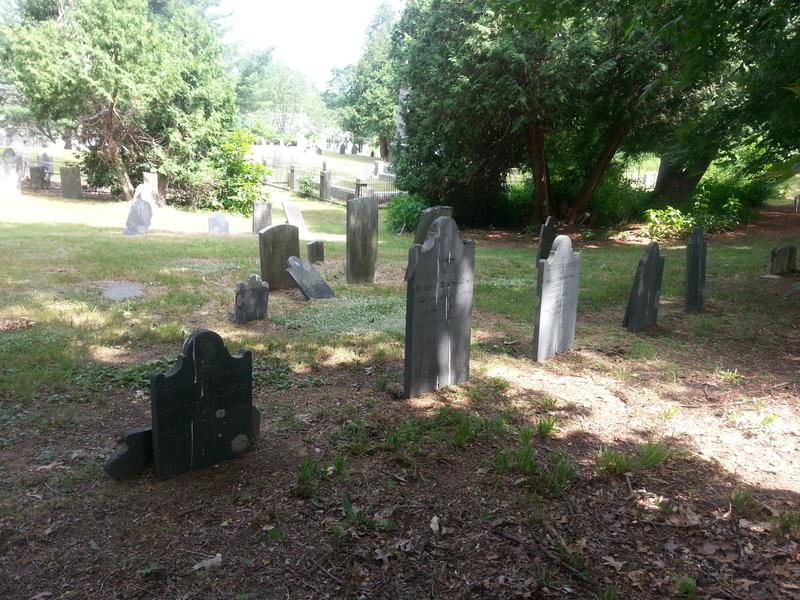 There are hundreds and hundreds of cemeteries in Rhode Island. Early on, there was little central control by any church. Each family would have its own cemetery. 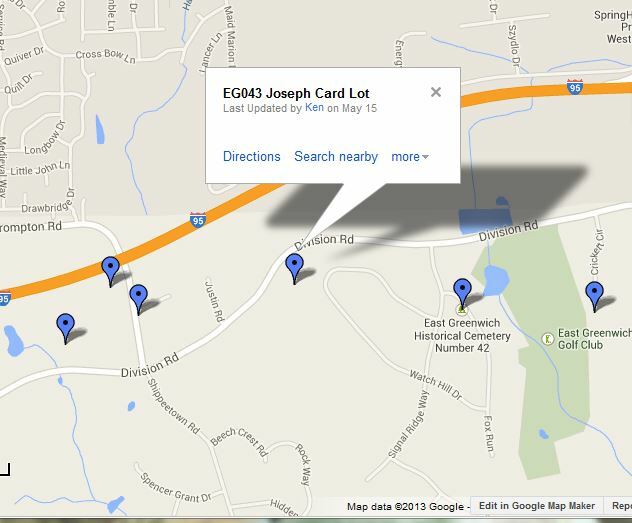 Looking up the “Joseph Card Lot” gave me a spot in East Greenwich where I believe the families mentioned in the 1790 census records may have been living. I base this on comparing the nearby family cemetery names with the 1790 census. To see many of the R.I. lots on the map, try this set of links at Google Maps. 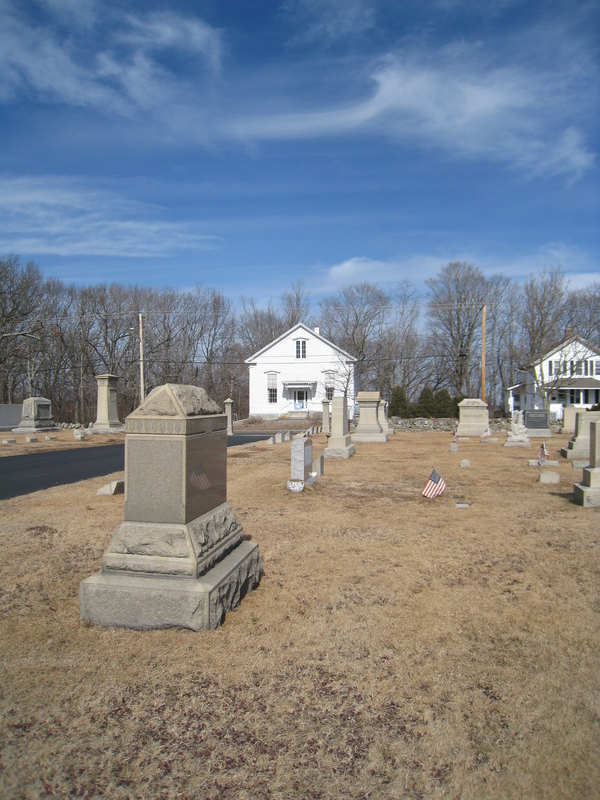 Note that sometimes, small lots were later moved when local cemeteries were built. Thanks to Google maps and some wonderful volunteers for this useful map. See my link, above. he “Served in Col. Harris’ Regt. in 1760, and in Capt Tew’s Co. in 1762” – this was taken from A List of Rhode Island Soldiers and Sailors in the Old French & Indian War 1755-1762 by Howard M. Chapin, 1918 (I have a reprint from Clearfield called Rhode Island in the Colonial Wars, 1994, 2010). Looking at my copy, I see there is also a Joshua, Benjamin and William Andrews in Col. Harris’ Regt. I don’t know if those names mean anything. he was listed in Roll Box 88, Roll State R.I. in the U.S. Revolutionary War Rolls. 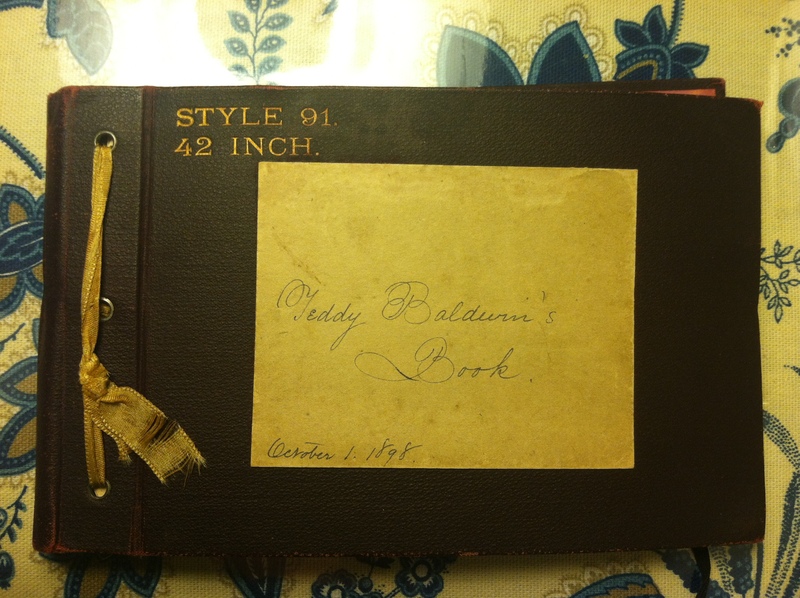 (I need to try to find him in the 716 pages; perhaps when the National Archives website reopens I can find an index.) That set of records is filled with original documents on Rhode Island regiments; I would highly recommend it (Ancestry.com. U.S. Revolutionary War Rolls, 1775-1783. Regiment: Crarys Regiment, 1777-79 (folder 45); Elliotts Regiment of Artillery, 1776-78 (folder 46); Kimballs…). I waited much too long to research the earliest Andrews in order to link them to the proper Joseph Arnold. Knowing all the descendants helped me to recognize the name Joseph Card when it appeared as a neighbor of Joseph Arnold in 1790. I suspect Jesse was living in Cowesett (in Warwick) before he left Rhode island but have not proved that yet. I have a lot of names I didn’t have before: Joshua, Benjamin and William Andrews served with Philip Andrews in 1760, there are neighbors in the 1790 and 1810 census, names appear in Warwick in 1810 and in Ashford in 1820 (perhaps coincidentally), and names nearby Jesse in the 1800 census. Also, there will be names from Phillip’s Revolutionary War service, when I can find the page. Perhaps I can make a connection to Ashford, or to some Massachusetts town that Jesse and Sarah may have stopped in for a while. I think almost nothing gets solved without knowing the community. The Benjamin Arnold that served in the military with Phillip is particularly worth following up on. If my guess is right, Jesse named one of his older sons Benjamin. There may be more siblings for Jesse and his brother Christopher. NEXT: visit the Warwick and East Greenwich town halls for vital, deed and probate records (I have tried before, but I often find a return visit turns up more). A visit to the Connecticut State Library might help me pin down Jesse’s wife Sarah’s 1861 death record, with a maiden name, which could pretty much clinch this one way or another. The later resolution of the Hannah Andrews mystery can be found in this post.